Two suspects have confessed to killing a cashew trader, Akintoye Oyeyemi in the Ajase-Ipo area of Kwara state when they tried to rob him of N10m they thought he had, PUNCH reports. While being paraded by the Oyo State Police Commissioner, Abiodun Odude, the suspects Gbenga Babalade, 40, and Tunde Jimoh, 37 said they killed Oyeyemi after robbing him of N100,000. Gbenga had overheard the victim discussing a N10m deal with his (Gbenga’s) brother Olayinka Babalade, and conspired with his friend Tunde to rob him at the location. They also took his heart to be used for money ritual. Odude said that an Alfa, Ahmed Olatunji, whom they contacted through a herbalist, Agboola Abubakar, 65 told them to get a human heart so that he can make them rich. 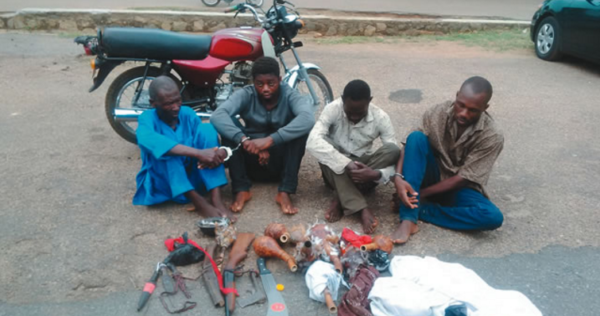 “To carry out their evil plan, Jimoh and Babalade under the pretext of doing business on February 24, 2017, lured the victim and robbed him of N100,000 before killing him with a gun. They removed his heart, severed his head and wrists for ritual. After the victim’s wife reported that her husband was missing at Atiba police station in Oyo, the anti-kidnapping squad of the command investigated his disappearance and during investigation, Abubakar was arrested, leading to three more arrests,” Odude said. “I helped my brother in cashew business. The person we killed was a partner to my brother. He came to discuss a deal with him and I heard about it. The deceased said he would bring N10m when he returned to complete the deal. I conspired with my friend who was around to rob him at Ajase-Ipo. Tunde also admitted to the crime, adding that he introduced Gbenga to the herbalist. He also said that he failed to provide a human heart for the ritual after collecting money from Gbenga.